Part of staying financially fit for us is regularly making sure we keep our expenses as low as possible. We are always working on trying to further cut back where we can. We’ve already cut a lot of expenses that many people pay without consideration. We do all of our own laundry and do not get our clothing dry-cleaned. My wife cuts my hair, as well as our son’s hair. I groom my dog regularly (cut hair, bathe, cut nails, and brush teeth). We do not pay for cable or satellite television. We do not pay for a house cleaner. My wife does not get any manicures or pedicures, and she gets a haircut once a year for $20. We check out books from the library instead of buying them. We bring our lunches to work and we usually cook dinner at home. We don’t pay for cell phone service as my office covers it. We also regularly monitor and keep our car and home insurance rates as low as possible. One expense we happily pay for monthly is Internet service. We get a lot of value out of being able to have WiFi Internet service at home. Instead of paying for cable or satellite television, we stream movies, television shows and children’s cartoons on Netflix or Amazon Prime with our Roku media player. Having WiFi at home also allows us to minimize our cell phone data usage. We have an older AT&T cell phone plan that only gives us 6GB of data usage with rollover (we average about 3-4GB usage combined). 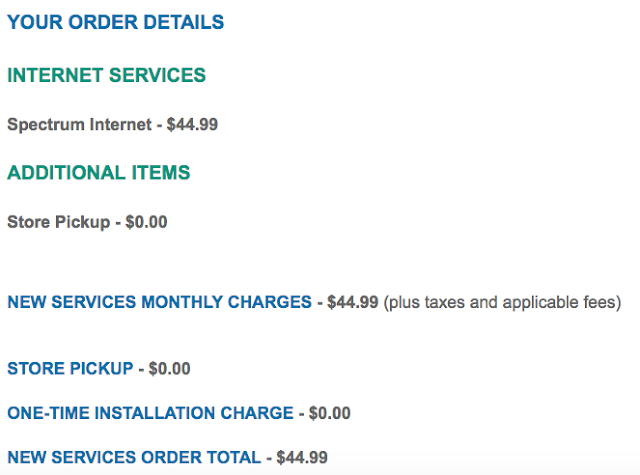 For the last 7 years, we have used Time Warner Cable Internet service. The only other option for Internet in our area is AT&T but they only offer very slow speeds. 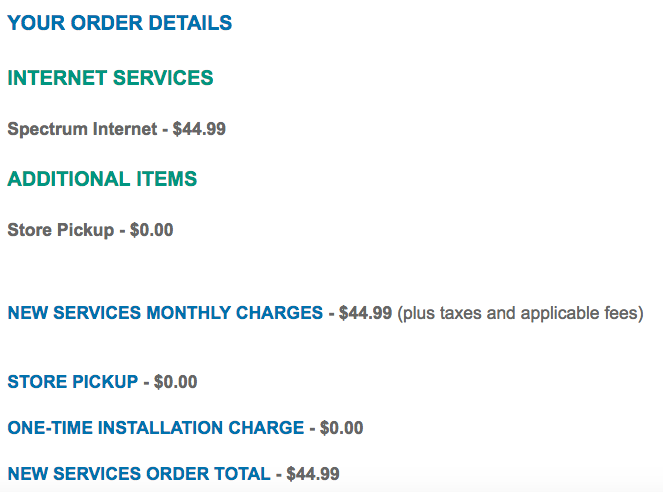 Over the years, we have been paying around $41.99 to $44.99 for 100Mbps speed Internet service each month. Every 6 months or so, our bill has gone up by $5, requiring me to call and negotiate a decrease in our bill. The reps that I speak with over the phone are usually very nice about lowering our Internet bill since we are long term customers. It’s a minor inconvenience to save that $5 each month, but it adds up to $60 a year. The phone calls usually only take about 5 to 10 minutes of my time. Spectrum took over Time Warner Cable a few months ago. I just found out that our next bill would have a $20 increase from $44.99 to $64.99! When I called customer service, they told me that I was no longer eligible for promotional pricing and that $64.99 would now be my standard rate. The rep would not budge or allow me to negotiate any discounts. $20 each month comes out to be an extra $240 each year on the exact same service. I bet most people will see the rate increase, shrug their shoulders, and just pay the bill. I knew I had to do something about this. 1. Cancel my service now and wait 30 days before signing up again as a new customer for the new customer promotional rate. 2. Cancel my service now and then have my wife immediately sign up as a new customer and receive the new customer promotional rate. Yes, the rep was actually recommending I cancel my account to save money! Option #2 seemed like a no brainer to me. I had the rep cancel my account. The next morning our Spectrum Internet service was cancelled. My wife then immediately signed up for a new account. Spectrum now offers free Internet modem, which they included with the new account. Although we did already purchase a modem a few years ago, I figured that the new one would probably be more efficient. On my wife’s lunch break, she drove to the local Spectrum store and picked up the equipment. Since we were going to do the installation ourselves (everything was practically already set up to run), we were not responsible for any delivery, activation, or installation fees. Setting up the new modem was a breeze – I just plugged in the network cable and plug the AC power cord into the outlet. Our Internet service was up and running again within 5 minutes. With a few minutes of work we were able to save $20 a month and $240 a year! Some people may be okay with throwing money away. We prefer to spend money on things that bring us value.